Ok...I'll admit it! I'm a craft freak! Yes..I always have been. 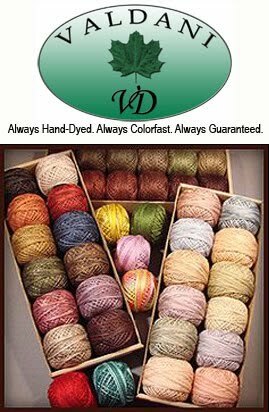 My mother was always working on something - knitting, crocheting, sewing, cutwork, painting... her hands were never still! Thanks MOM! I'm so glad I inherited these skills from you. So.. with that in mind... I have to show you some of my favorite ideas that I am putting into place! First... so easy - for all of us. Look at this basket display. so... for those of you that know me personally, it's not any wonder I love this display! 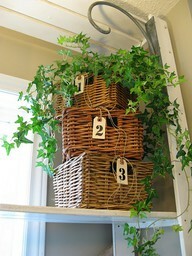 BASKETS are my passion and to pair them up with IVY (which is another of my loves) it's just too much to handle! I can't wait to find some of these bad boys. I'm thinking World Market will be a great place to look. I was just in there last night...rats... I wish I would have thought to look at that time. I'm going to set them on top of my antique cabinet with nice lamp... yum! Wait until you see what I bought! It is so darn cool, I know all of you will want them (for those of you that like to bake cookies..that is!) 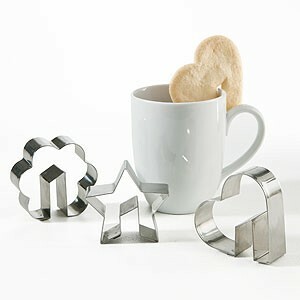 Check out these cookie cutters! Are they not adorable? I got the star and the flower - the hearts were already GONE (the nerve of those shoppers). They are only $1.29 each and the recipe for the sugar cookie is on the back of the package. I ssssssssssssooooooooooooo can't wait to try them. I got mine at World Market. Here's something else I'm going to try. Ok.. imagine this - take some bread - cut out the star cookies - an even number of them... let's say 12! Lie them on a cookie sheet - brush with butter and sprinkle with garlic salt and some parsley(on both sides). Put them under your broiler until crispy brown on one side - turn over and brown the other side. Let them cool. Take two of the stars and join them at the slit area (where it would sit on your cup). Place a couple of these sets on top of a yummy Caesar salad - you have 3D croutons! Doesn't it sound like it will work? Well, I'm trying it today... I simply must! I went to sleep last night thinking of all different ways to use these sweet things! I'll let you know the results. Here is a mixture of my passions!! 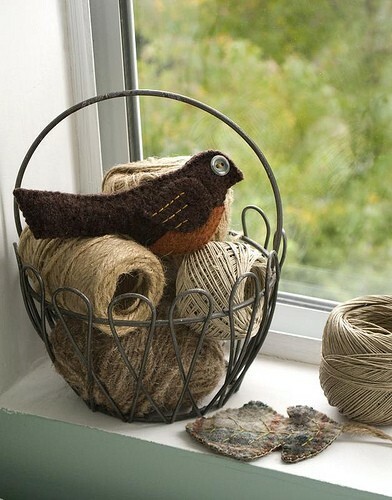 Wire baskets (antique ones are the best), birds, wool, and antique string balls/spools. Are you scratching your head wondering where all of these "likes" come from? I have NO CLUE... but I know I love them! This little bird is all sketched out in my sewing room and it will take no time to stitch him from my wool scraps. Then... while I'm in World Market - I'm looking at their wire baskets. I have just the place where I'm sitting this sweet thing! Isn't this a fabulous red chair. Here's the trick! The flowers are FOAM... you know the foam shapes you can buy at the craft stores? 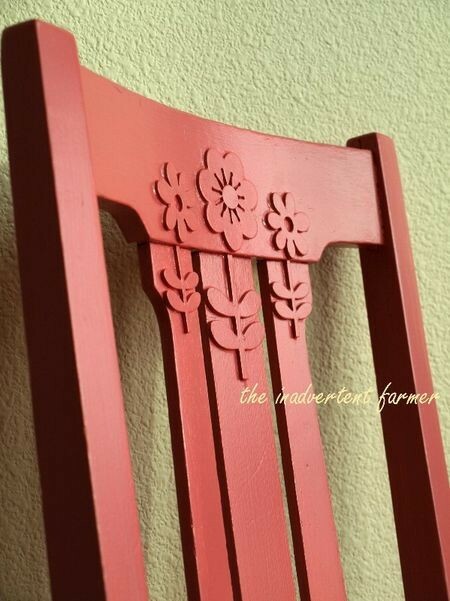 Pick out your favorite shapes, glue them onto your chair (or whatever you are working with) and paint over them. I would not recommend they be used on something that will get alot of high "traffic" (from children). The next time I'm in Michaels or Joann, Etc. I will be taking a look at what they have. 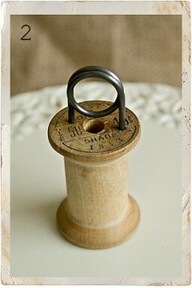 These would also be cute on a frame - then paint the color of your choice. The possibilities are endless! 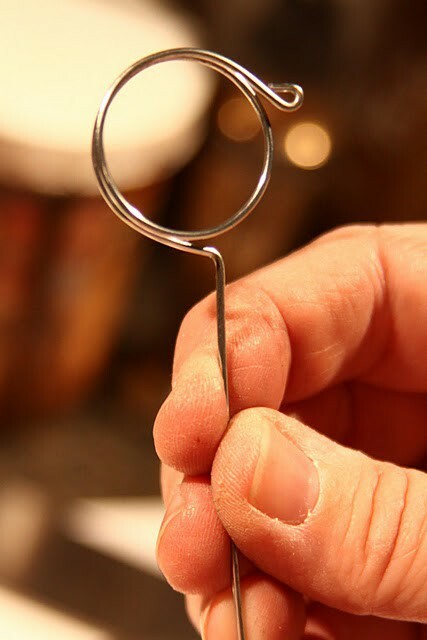 Simply drill two small holes into the end of a wooden spool - insert a small amount of glue and pop in your wire. Then pick out your favorite recipe or photo and insert between the wire curves. It's a great way to have name tags for dinners, label your food at a buffet - use in your store with information on a product, hold price tags.... is your mind working??? FEEL GOOD - SMILE TIME!!! Is this not unbelievable??? Can you imagine being a photographer and capturing this picture. It took my breath away... so awesome. 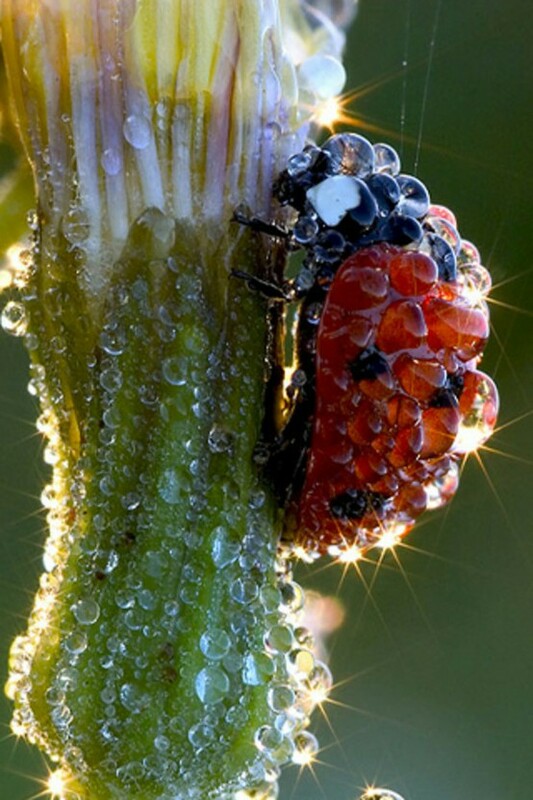 Can you wonder what in the heck that lady bug is thinking right now? I know Christmas is over.. but I just can't help myself. Look what I just found on Pinterest!! I must make one of these fellows. I already have some snowmen and/or Santas that will work. 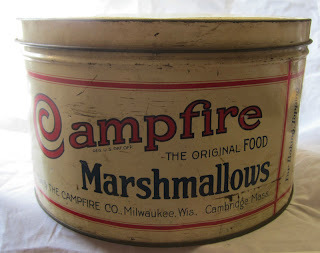 Does anyone know where I can find one of these tins? Be right back... I'm going to ebay to take a peak! .......time laps............ Found one.. but it's a short fellow! It's only 6" tall... just won't have the right POW ! I'll keep looking. If anyone of you find one, let me know!! 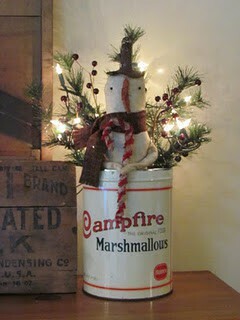 Plus... even though Christmas is over, I think I will keep sending you cute ideas, etc. You can trash them or keep them for future reference. It's just to sad to wait until December to share. Just too, too, many fun things to see! Let's get organized! Daily chore for the day! Throw out the JUNK in your junk drawer! Wow.. do I ever have a junk drawer(s). Do you have more than one? Yes.. I'll admit.. I do. One in the kitchen, sewing room, and desk. hhhmmm... which one to visit first?? ?